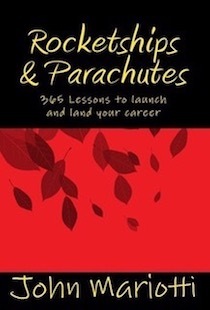 Rocketships & Parachutes will help readers of all ages, at all career stages, capitalize on their knowledge--to know when and how to “launch" their careers on a new trajectory (Rocketships), and also understand when to find a way "to land” (safely via “Parachutes") after a tackling a challenge that somehow didn’t work out as expected. Steering a path through a turbulent future, in which the old ways are disappearing, to be replaced faster and faster, is critically important. Understanding how and when to take action, lead, follow, manage, strategize and execute are the keys to building a successful career trajectory. Knowing when to grab for a parachute and land in a safe and positive way, is the key to keeping those careers moving onward and upward. Understanding how to work with people of all kinds, of all ages, in different situations, and create positive outcomes--win-win outcome--is a critical skill for the future. College grads will realize that it gives them a head start into the world of work--ahead of their peers. Mariotti explains how HANDS UP came into being. "After spending a couple of years learning to box, I realized that the lessons about boxing provided great metaphors for lessons in life and work. 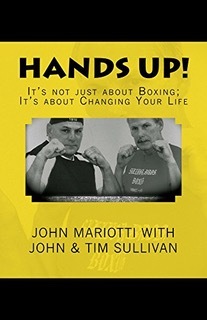 In fact, the subtitle of this book, “ti’s not about boxing; it’s about changing your life,” was a sign on the wall of the Sullivan Brothers boxing gym. The book came about after a series of sessions discussing the similarities between boxing, work and life. After allowing the nearly finished book to sit for a couple of years, I was encouraged to finish it and get it out where people could enjoy it. Here is the announcement. HANDS UP is a story about two guys from Columbus, OH who decided to try their idea and fulfill their dream--to own and operate their own boxing gym. They didn't want to become one of the “cookie-cutter” franchise gyms. This was going to be “personal,” because boxing is personal, and the preparation needed, is something that each person must do differently. The Sullivan brothers wanted their gym to appeal to all ages, both genders--in other words--everyone. The reason is simple. The most important lessons in boxing apply equally to life, and work, and that’s what this little book is all about. The lessons line up so well, it's hard to forget them, once you've understood them. Life is hard; work is hard; so is boxing. But anything worthwhile in life, in work, and in boxing takes dedication and hard work. That's why this book is not just about boxing; it’s about changing your life! You can get "HANDS UP” in both kindle and paperback at AMAZON.COM. John Mariotti's new novel The Chinese Conspiracy poses a huge question: "What Happens When Nothing Works?" What if all forms of electronic communications and computer controls were "shut down" at once? 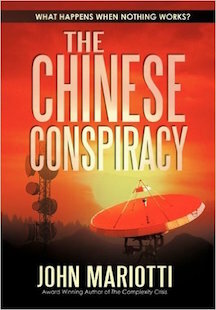 This is exactly the frightening prospect posed by John Mariotti's new novel, The Chinese Conspiracy. The U. S. government is temporarily helpless, as panic spreads. Evil forces are using global extortion to exact a frightening toll. John Mariotti's thoughts will now be available on a wider range of electronic media than ever. As a weekly regular on the brand new digital news magazine -- As a periodic contributor to The Daily Journal . John's long-running bi-weekly commentary in "Telling It Like It Is." A New, Fun And Informative Book. Easy reading for everyone with lessons on life and work derived from the sport of boxing. 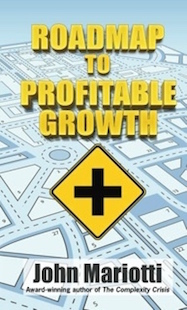 A proven successful solution to the first and biggest challenge cited by CEOs, which every company faces; finding profitable growth; when so many markets are growing slowly or not at all. 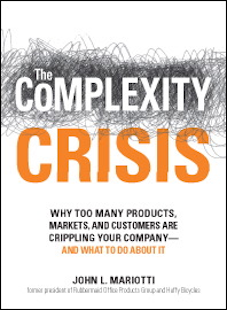 Why Too Many Products, Markets & Customers Are Crippling Your Company--And What You Can Do About It. The second most challenging and perplexing problem cited by CEOs, which is seldom measured or managed, defocuses companies efforts and just keeps coming back (like weeds in a garden). A fact-based novel on cyber-terrorism and an international conspiracy against the USA; an attempt to shut down all computer-controlled systems at once. The Power Of Partnerships The Next Step Beyond Tqm Reengineering And Lean Production. The classic book and seminal work on how partnerships are built and can be the central part of a powerful business strategy. A recognized breakthrough book on developing and communicating strategy; an Inno-think Award winner and an Award Winning Book for Leaders. Smart Things To Know is a breakthrough series that offers an easy to read learning experience for time-stressed business people. This book reveals that while marketing entered a new era thanks to globalization, the Internet, e-commerce, and the worldwide explosion in outsourcing, telecommunications and computing infrastructure, marketing’s origins and fundamentals are still important and influential. A complete description of how brands came to be important and how they are an integral part of strategies for companies, and a key factor in a company’s identity. Covers all the key techniques for successful marketing, from CRM to brand management, and from failsafe planning to making the most of global opportunities. From understanding the different reasons for partnerships and alliances to initiating and succeeding with partnering. This is a very effective tool for any organization attempting to achieve results through people working together!